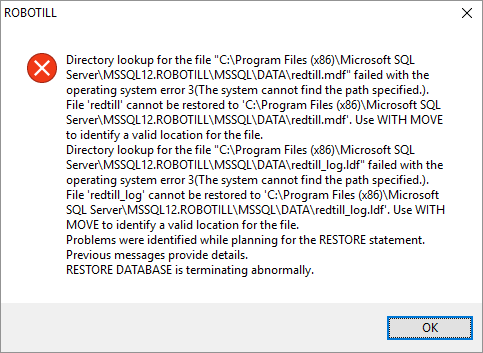 Warning: When you do a database restore any data that was added after the backup was done will be lost. 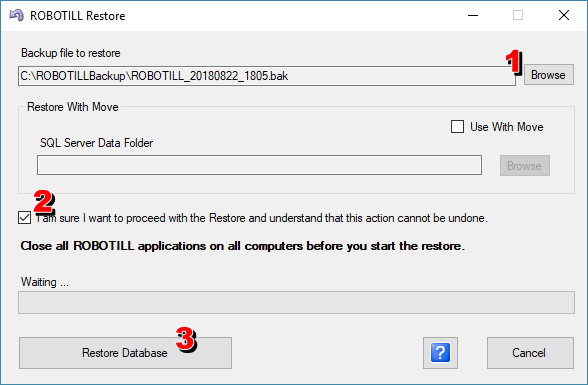 A restore can only be done if you have a backup file that was done with a ROBOTILL backup. 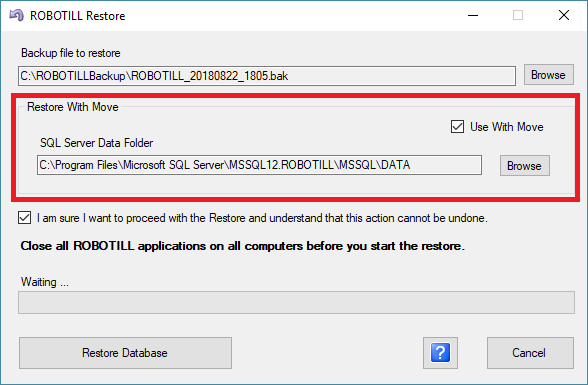 To do a restore, go to Manager > Tools > Database Tools > Restore Database. Select your backup file. Note that your backup file should not be in a user folder like 'Desktop', 'Documents' or 'Downloads'. Check the box to confirm you want to do the restore (see the warning on top of this page). Use the instructions above to do a restore. A 'Restore with move' is only needed if you get the error below. If you did get the error above it is usually because you moved from a SQL 32 bit server to a 64 bit (or the other way round). In that case, follow the instructions below. You first have to find the location of the new database files. 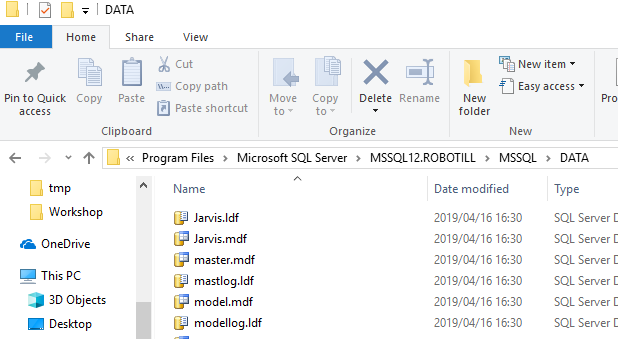 Using File Explorer navigate to the MSSQL12.ROBOTILL\MSSQL\DATA folder. It will be in one of the following locations. Depending on how your Windows is installed the path or drive letter might be slightly different. Make sure to navigate to the DATA folder. You might be asked if you want to continue as it requires user permission. Keep the data folder open in file explorer (to avoid permissions issues). Then do the restore again but this time use the 'With Move' option.